Winner in two of his four starts in 2011, Gung Ho followed up a Maiden Special Weight win with a victory in the $150,000 Sunday Silence Stakes at Louisiana Downs. His 2011 earnings surpassed $118,000. Shumoos won two of her seven starts in 2011, running mostly in England. She was placed in two Group 2 races before winning a Group 3. Later in the year she came to the United States where she finished a close second in the $500,000 Sentient Jet Breeders’ Cup Juvenile Sprint competing against males. She closed out the 2011 season with over $163,000 in earnings. Anthony’s Cross only ran three times in 2011, but he made his races count. He started the season finishing third in the Sham Stakes (G3) at Santa Anita before winning the Grade 2 $250,000 Robert B. Lewis Stakes. He finished out the season with $182,000 in earnings. Plum Pretty had a remarkable season on the track in 2011 competing almost exclusively in Graded Stakes company. She won three of nine races with two seconds and two thirds. Plum Pretty won the Grade 1 Kentucky Oaks at Churchill Downs, the Grade 2 Cotillion Stakes at Parx, and the $200,000 Sunland Park Stakes. She was graded stakes placed in two other races before finishing fifth in the Grade 1 Breeders’ Cup Ladies Classic against older horses. She completed her season with over $1.3 million in earnings. Smart Bid earned over $583,000 in 2011 by winning only one race. He won the $400,000 Mervin H. Muniz Jr. Memorial Handicap (G2) at the Fair Grounds. Smart Bid was Graded Stakes placed four times in 2011, including close second place finishes in the Gulfstream Park Turf Handicap (G1) and the Woodford Reserve Turf Classic Stakes (G1). In 2011 Sahpresa was voted Pennsylvania-bred Champion Turf Horse for the third year in a row and Champion Older Female for the second time in three years. She won the Group 3 Palais Royal Stakes at Longchamp racecourse in France and won the Group 1 Sun Chariot Stakes at Newmarket racecourse in England for the third year in a row. Sahpresa ran six times in 2011 in three different countries, winning twice and never finishing off the board. She earned over $794,000 in 2011 and has lifetime earnings of over $1.8 million. Divine Fortune won the A.P. 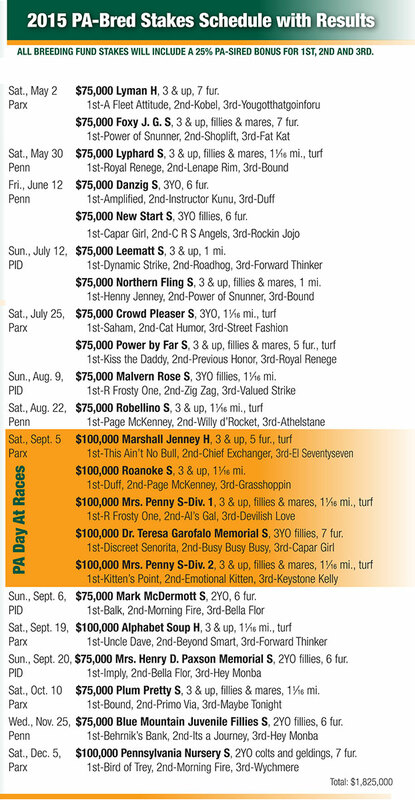 Smithwick Memorial Steeplechase Stakes (G2) at Saratoga for the second year in a row. He concluded his season with a close second place finish in The Colonial Cup Hurdle Stakes (G1) in Camden, S.C. Divine fortune earned $64,000 for his connections in 2011. Real Quiet led all Pennsylvania stallions with $73,740 in stallion awards. George Strawbridge Jr.’s Augustin Stable led all Breeding Fund Recipients in 2011 with $206,240 in Breeders Awards. For the fifth year in a row Augustin Stable has won this award. Horses bred by Augustin Stable won over $2,769,000 in 2011. Major earners include 2011 Pennsylvania-Bred Champions Smart Bid and Anthony’s Cross. Other major contributors were Dynamic Holiday, Emerald Beech, and Fugitive Angel.